It’s instructive to know that the director and co-writer of this film, Baz Luhrmann, was the man who brought us Moulin Rouge, Australia, and Strictly Ballroom. He is given to big shows of excess and was likely naturally driven to Gatsby, a character almost defined by his excess. But alas, the classic novel by F. Scott Fitzgerald, is a more serious look at American character than Luhrmann wants to acknowledge, at least during the first half of the movie. I saw the film in 3D, mostly because my spouse is driven to see in 3D whatever is out there in 3D, notwithstanding paying extra every time for the glasses. (They have stopped charging for glasses in England unless you need them. You can take them home and then bring them back. What a concept!) Luhrmann’s use of 3D is the epitome of what I expected when they started doing 3D for non-cartoons. In fact, he has turned much of the movie into a cartoon, a painful distraction in the first hour. For those of you who haven’t read the book or forget the plot, the story, narrated by writer Nick Carraway (Toby McGuire) is about Jay Gatsby’s (Leonardo DiCaprio) infatuation with Nick’s cousin Daisy Buchanan (Carey Mulligan), who is married to Tom Buchanan (Joel Edgerton). 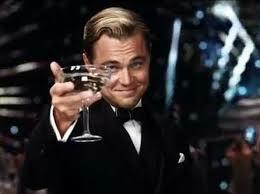 Gatsby lives in Long Island in West Egg and Daisy and Tom live in East Egg (read: Hamptons). Jay is an outrageous character, dashing and dapper, and holder of wild parties that everyone must attend. He finally confesses to Nick that all of his outrageousness, indeed most of his life, is about winning Daisy. Over time Luhrmann calms things down, but not before people play catch indoors, characters seem to lunge at the camera and all sorts of things jump out at us, screaming “we’re in 3D, isn’t that fun?” The visual distractions draw one away from the words and actions, except when the actions of the cast of hundreds at Gatsby’s parties are straining with over-the-top outrageous behavior – set to rap music, really – to the point where we “get” the decadence one time too many, in this shallow ironically one-dimensional portrayal. As the story moves on we and it become more grounded and relieved by fewer 3D tricks. Both Daisy and Gatsby, but especially Gatsby are trying hard to become people who are other than who they are. American class differences are paramount even within the actuality of dastardly behavior on Tom’s part and the sincerest love on Jay’s. 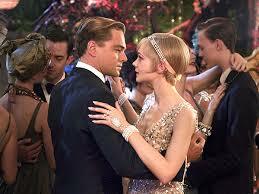 DiCaprio captures Gatsby’s yearning earnestness, his struggle to overcome his background, and his missteps. 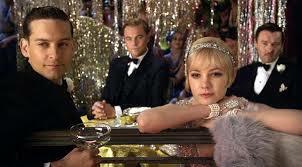 Yet the movie is uneven, with Luhrmann making Gatsby almost a slapstick figure at times, as when he nervously prepares to meet Daisy alone at Nick’s house. Mulligan is a perfect Daisy, a woman who wants all of the possibilities there are and thinks she can have them because she is who she is, rich and beautiful. She is pretty much correct. On screen, the demeanor of Tom Buchanan comes across as more of a gangster than a patrician, even as he flaunts his background. Of course, that is the point, even as it is exaggerated by Luhrmann. Tom can behave any way he wishes, while Jay’s behavior is forever self-conscious. The historical touches of the movie are special, like gems in a sandbox. I never thought about the fact that the road from Long Island to the “city” at the time would be an unpaved dirt one, littered with construction sites and dirty gas stations. Likewise the lack of air conditioning, the clothing, the sets, remind us of times gone by. No doubt all details aren’t accurate, but the image of an overdressed group of privileged people in a hotel room in the summer, surrounded by electric fans poised above cakes of ice, is an interesting touch of historical reality. This film failed to grab popular interest this time around, perhaps because, unlike the English, we Americans are losing the distinction between “old” and “new” money. Our money was never very old anyway. We are fascinated by Downton Abbey but at home have little interest in the real past. On the other hand, perhaps critics and public were simply put off by the incredible patchiness of the film.